Does the area around your outdoor pool look drab and plain? Do you want to make this outdoor recreation space more inviting? Let’s face it in summer your poolside can be the focal point of family living, so it needs to be inviting and relaxing. An easy way to spruce your pool area up is to add some poolside plants. 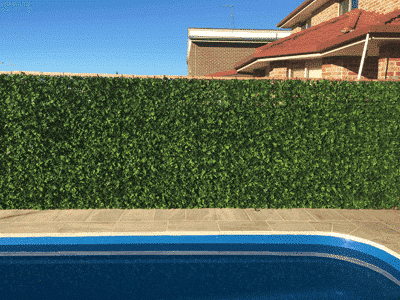 The greenery can provide shade and in the very least it helps to reduce the temperature around the pool – especially if it is predominantly concrete, to begin with. Before you get started there are some things that you need to think about when choosing the right plants for you. Think about what you want to be the final result and use that to help determine the best greenery for your needs. Hardiness: the plants you choose need to be able to put up with either chlorinated or salty water depending on the type of pool that you have. They also need to tolerate wear in areas that are likely to experience lots of foot traffic. 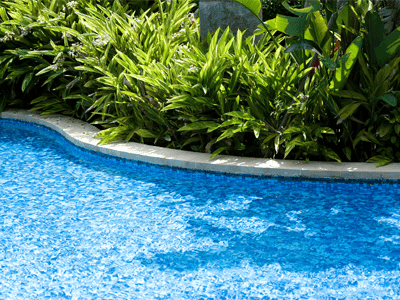 Maintenance: maintaining poolside plants can take up your time especially in hotter weather. You can offset this with low maintenance or artificial plants so you spend more time enjoying your pool rather than taking care of it. Any plants that grow low to the ground, plant around 6-8 feet back from the edge of the pool to avoid debris dropping into the pool. Trees that are deciduous (any plant that loses it leaves) or have spines/cones are not recommended. Privacy: use greenery to turn your poolside into a private space to relax. Pick screening plants and place them strategically for maximum effect. Space: the amount of space that you have available for planting will affect the plants you use. If the area is small, consider using hanging or climbing plants, or even pots. Climate: It is important to choose plants that suit your climate; so they can withstand the weather and climatic conditions. What are the best plants to put around a pool? When you are looking at pool landscaping plants, the types of plants you have to choose from will depend on the water in your pool. Once you have chosen the plants for your poolside area its time to consider different ways that you can landscape. Here are some ideas to get you started. Clean lines: Use plants that have interesting foliage to create a stylish area to fit your home. Keep it to monotones of green with a featured fig tree and a lush ground cover to complete the look. Fig trees are ideal for areas where privacy is a must. Home resort: create the chic look of a resort in the comfort of your backyard. Try using planters with dark foliage that contrast with magnolias, and giant lilyturf covering the ground. Multi-level planting: if the area is steep around your pool you can adopt a tired approach. Segment the area into the different levels and choose plants that will stand out at each level. Try different colourings to create a vibrant display. Create a tropical feel: you may not live in a tropical area but you can bring that exotic atmosphere to your backyard. Tropical plants around pools give it that great I am on holiday atmosphere. Some plants have the potential to damage your pool area with their root systems. Bamboo, umbrella trees and rubber trees can cause problems with underground plumbing and your paving. Avoid these in your landscaping plan to ensure that you don’t create problems in the future.